We provide eCommerce website development services for startups and businesses. 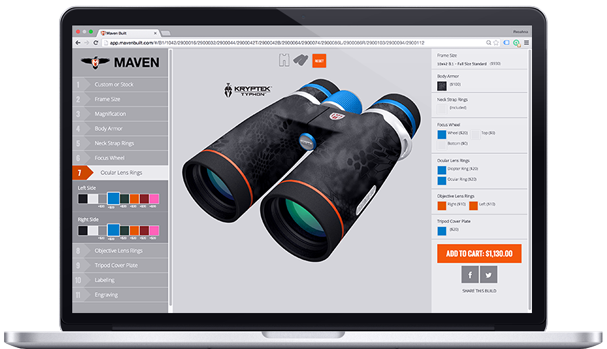 One of our eCommerce clients is Maven, a custom outdoor optics company. (Think: binoculars and sighting scopes for hunters, bird watching enthusiasts, and travelers that you can customize yourself.) We were able to refactor the way their current ASP.net / Angular.js web application works with Shopify’s API to avoid a complete costly overhaul. We work with them every month on web application improvements. We’re constantly working with Maven to add new products, pay attention to their analytics data, monitor user’s experience, and helping them make better eCommerce decisions. We’ve saved them hours each week in sending orders to vendors and reduced the number of costly mistakes and incorrect customer orders by adding in a pdf export feature. Restructured their Google Analytics setup to allow them to view an eCommerce customer at any point across 3 servers. They were previously told this was impossible, so they’re pretty happy about having this ability. Their data is now more accurate than ever, which has enabled them to make better business and marketing decisions. Shopify is just one of the eCommerce platforms we use. At it’s core, it’s a powerful eCommerce platform that helps large brands like RedBull and The New York Times grow. It’s platform is also suitable for smaller eCommerce businesses looking to start up and grow. As a registered Shopify Partner, we’re very familiar with their eCommerce platform and growth potential. Maven is just one of the projects where we’ve done custom Shopify integration. We’ve also done this for other large eCommerce brands, like ROKA Sports. An eCommerce site needs constant attention and a team that’s available at a moment’s notice. We know it’s important to keep things like: conversion rates, average order value, website speed, backups, and event tracking on your radar. These are the types of things we do for Maven and we’d be happy to do them for you too. Let’s talk about your eCommerce website and see how we can help make you more successful.